Kids trying cricket for the first time. 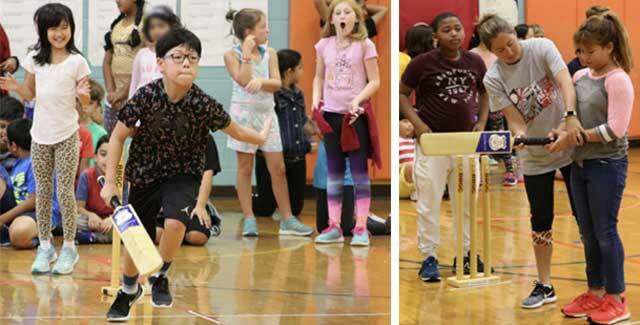 Excitement and jubilation filled the gym at Veterans Elementary School (VES) in Ellicott City, Maryland as the students chanted for their classmates to hit the ball for a six. The students were taking turns batting while The Cricket Guy, Sham Chotoo, and coach Falgun Patel bowled to them. The students had just received a 15-minute explanation on the basics of cricket, and they were all eager to give it a try. Sham is the Cricket Commissioner of the Bowie Boys and Girls Club (BBGC), and in 2014 he started the BEST Cricket League, which is the first and only elementary school cricket league in the USA. Falgun is the head coach for the Maryland state 16U cricket team, and he also helps to run the Howard County Cricket League for adult players. Susan Chotoo is the official photographer for the cricket program and was also there to take photos of the event. With 100 students in each of three back-to-back, one-hour sessions, Sham, Falgun and the PE teachers, Jacqueline Viguers and Kristine Hahn, were able to get everyone hitting the ball at least once and scoring a run. With such a large group of students, Mrs. Viguers and Mrs. Hahn’s main concern was safety, and they came up with the right solution to make it work. Two batting stations were set up. While all the students waited in an area behind the batters, two students batted, one played wicketkeeper, and one fielded. After the batters each hit the ball once and ran for one run, the wicketkeeper and the fielder would then become the batters. The two batters would then go and sit down, and two new students would wicketkeep and field. Since VES is an ethnically diverse school, many of the kids had heard about cricket before. A few of them told the coaches that their dads still play cricket. However, many of the kids did not know anything about the game. Even the ones who had heard about the game before did not know the basic rules. It warmed the hearts of the cricket coaches to see how excited ALL the kids were to participate. Mrs. Viguers and Mrs. Hahn had always wanted to do cricket because many of their students would ask them about the game. Principal Robert Bruce is also keen on starting cricket at VES. Even though they already had cricket sets, they just did not know how to go about it. That changed when three students told Mrs. Viguers that Coach Sham was willing to come to the school to do cricket demonstrations for the students during PE class. The three VES boys (Pradyumnan, Sai, and NagaSaish) played cricket for the club team at Ellicott Mills Middle School in the WAMS Cricket League because there were no elementary school teams in Howard County in 2017 and 2018. They also played cricket for the Bowie and Ellicott City travel cricket teams. After seeing and participating in the cricket demos, Mrs. Viguers and Mrs. Hahn can now teach cricket and incorporate the skills in their PE classes when they do their striking and hitting unit. The BBGC also provided free cricket sets to the school to use during PE class. Flyers went home to all 3rd, 4th, and 5thgrade parents with information on the cricket program. To register their son or daughter, parents simply needed to email the required information to the Cricket Commissioner. Within 24 hours of the flyers going home, there were 24 students registered to play cricket including four girls. During the cricket demos, Coach Sham and Coach Falgun found that most of the girls were batting better than the boys. At the elementary school level, girls do just as well as boys in cricket. Veterans is the first elementary school in Howard County to form cricket teams at the club level. The Howard County Youth Cricket Program, which is part of the Bowie Cricket Program, is planning to start cricket clubs at other elementary schools in the county and have the teams playing against each other in Spring 2019 in the BEST Cricket League.